Here you are at the first post in a four-part series, The Creative Approach. This is the first series I've done for this site, though probably not the last. Enjoy! What is it to approach something, if not to draw closer? To approach requires movement. 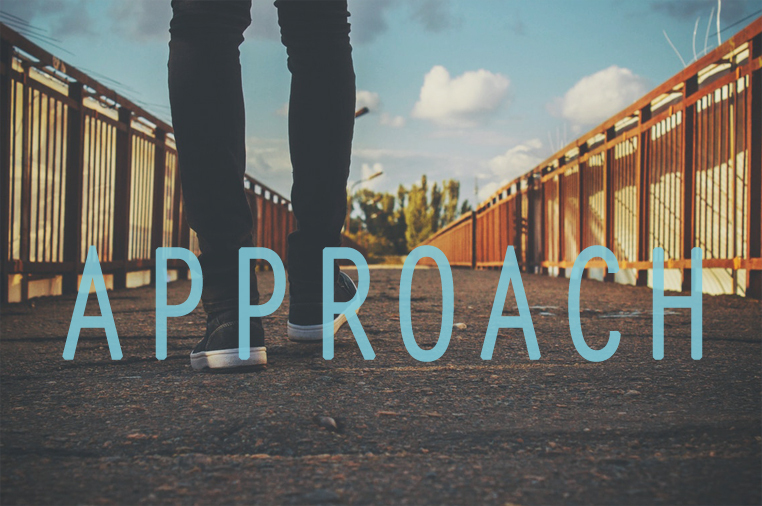 When you make an approach, you move away from one thing toward another. By taking a creative approach, you are allowing something to come to life: an idea, a thought, an inkling. You move away from an unfulfilled, unenthusiastic life toward one of purpose and excitement. It’s more than just a shift, it’s a move from nonexistence to existence, and that’s no small step, even for Neil Armstrong. It all begins in the mind—your imagination. But how do you get there, from nothing to an idea, from a dead standstill to a sure-fire approach? Well, rocket boosters and 2,000 tons of fuel would help, but lets say you don’t have that on hand. It starts with motion. Without this, nothing happens. Creativity often comes to us while we are actively doing something, not sitting around staring blankly at a screen with our minds in a cat-GIF induced coma. It also comes when we set circumstances in its favor. For example, when we aren’t distracted by one million to-do’s or news updates and instead allow our minds to wonder a bit. So the creative approach is not just about movement toward something, but also away from something. We move from distraction toward focus, from inactive toward active. Newton knew well enough that objects without motion tend to stay that way while moving things keep on a-movin’! This is why starting is often the hardest part: it takes focused effort to get from stationary to mobile, to build momentum, but it’s no less necessary. A story doesn’t begin until something happens—something that matters to the plot and character. Your creativity won’t kick in until you get your groove on and move on. But how do you do it? How do you transition from still to loco-motion? How do you get the ball rolling, the crank turning and the hopper hopping—just how do you generate creative motion? The creative approach is a three-step dance. The first step in the creative approach is to observe. Next, you ask questions based on your observations. Questions get the gears turning, which get you thinking in new ways. Finally, we come to the third and final step: respond. Let me repeat all that, but with different words: you must first take a new angle, head in a new direction. After you do, questions allow you to look at the matter from a different perspective, or as they say in the biz, get a new view (no, they don’t actually say that in the biz, I don’t even think they say “the biz” in the biz, who are we even talking about?) and, once you’ve gained your new view, you’ve got to do something about it: you must respond. Give it a try, take some time to examine the world around you, even if it’s just a 15-minute walk around the block, then ask some questions and, lastly, find a way to respond that is unique and engaging. Hopefully this is something you do naturally, but it never hurts to pick a time and place to focus specifically on this practice. As you’ll see, an approach isn’t all that hard once you make the first move. Hey Creatives, when was the last time you took a creative approach to something ordinary? Let us know in the comments below.